If you are one of the many Virginia Beach homeowners out there who is looking for that extra little something to take their landscaping design to the next level, and you aren’t looking to spend a great deal having new stone features or more plant life installed, new landscape lighting might be an option worth considering. Here at Winesett Nursery & Landscaping, our team of highly skilled landscaping professionals can assist you in finding and installing the brand new landscape lighting you need to create the kind of outdoor space you’ve always dreamed of. Are you looking for a Virginia Beach landscaping pro that can help you with all of your landscape lighting needs, no matter how simple or complex the design you have in mind might be? If so, give our team of skilled professionals a call today and let us show you the kind of quality service that has helped to make us one of the most trusted names in quality landscaping services throughout the local area. 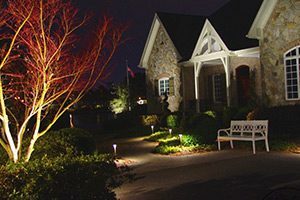 Here at Winesett Nursery & Landscaping, we understand just what an asset proper landscape lighting can be, and we want to do everything in our power to ensure you get the kind of quality installation that is going to have a noticeable impact on the beauty and function of your landscaping for many years to come. 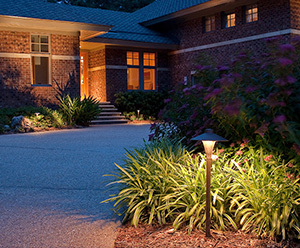 Whether you are looking to highlight some of your favorite landscaping features, illuminate your walkways so you can enjoy your outdoor areas at night, or just brighten up your property for those outdoor gatherings of family and friends, our team of skilled landscape lighting professionals can help. If you have any questions about our full line of high-quality landscape lighting services, or if you would like to schedule an appointment for a consultation, give us a call today. Our team of experts are always standing by and would be happy to assist you. With the right landscape lighting design for your Virginia Beach home, you can truly put your creativity on display for the world to see. Landscape lighting is great for helping you highlight those areas of your property that you are particularly proud of, and help draw attention away from those areas that aren’t quite up to your standards or have just never really been your favorite. Additionally, the right landscape lighting layout can give you something that truly makes your home stand out from all of the others in your neighborhood. For all of your landscape lighting design and installation service needs, you can count on the pros here at Winesett Nursery & Landscaping to get the job done and get it done right. If you are looking for quality landscape lighting services in the Virginia Beach & Chesapeake areas, give us a call today at 757-426-7880 or fill out our online request form.